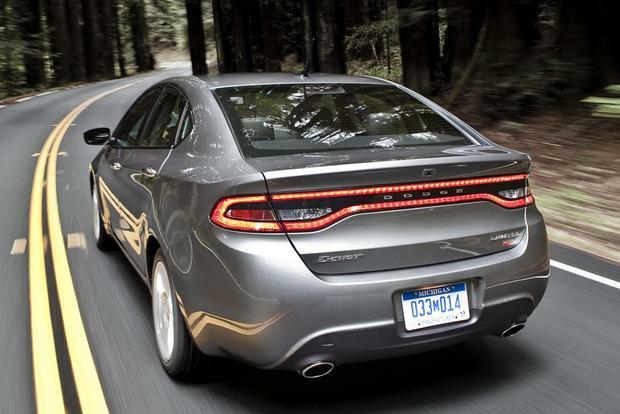 The Dodge Dart offers a stylish, fuel-efficient take on the notoriously dull world of the compact sedan. The 2014 Dodge Dart complements its Euro-inspired chassis with wider availability of the torquey and flexible 2.4-liter 4-cylinder engine. 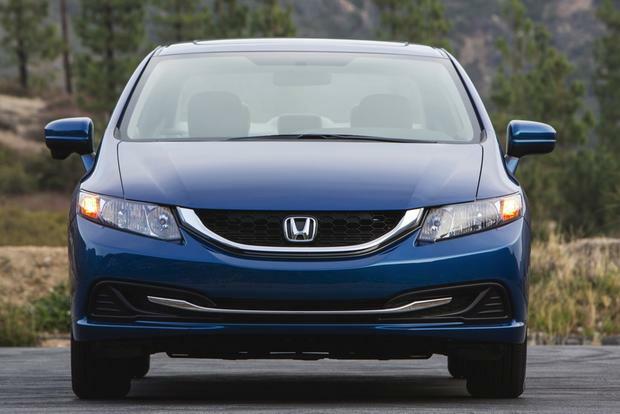 Looking for a compact car on a budget? Start your search with our list of CPO compacts for under $15,000. 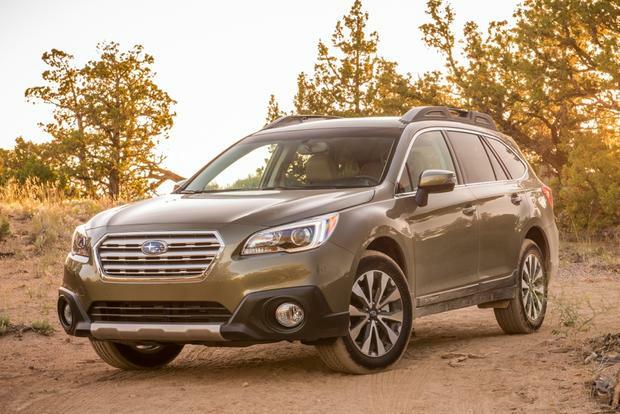 We've listed today's top sedan and wagon deals for shoppers interested in getting a great deal on a new family car. The 2015 Dodge Dart serves notice that Chrysler's compact cars are back in a big way -- with a little help from new corporate parent FIAT, of course. Although Chrysler is no stranger to the compact segment, from the workaday K-cars of the '80s to the perky Neon of the '90s, the company fell behind with the advent of the Dodge Caliber, a low-quality hatchback best known for populating rental lots at airports. Happily, FIAT has decades of experience building small cars in Europe, so it offered up the mechanical bits from its widely praised Alfa Romeo Giulietta hatchback for the Caliber's replacement. Dodge's stylists and engineers made a nip here and a tuck there, and voila: The highly satisfying Dodge Dart was born. To be clear, the Dart is very much its own car. Modifications for the American market include a unique sedan-only body style, a new interior with the option of Chrysler's excellent 8.4-inch touchscreen, and a chassis that's longer and wider than the Giulietta's. One thing that's been preserved in translation is that palpable Italian zest for the open road. Unlike most compact cars, the Dodge Dart feels like it was built by people who love to drive, demonstrating ride and handling characteristics that are more befitting of a sport sedan. There's also a real sense of occasion in its tidy sheet metal and sculpted, high-quality interior. Dart downsides include an equipment roster that's biased heavily toward higher trim levels, as the entry-level SE model lacks connectivity features and doesn't even come standard with air conditioning. Car shoppers are increasingly willing to spend $20,000 or more for a small car, however, and if you're one of them, you definitely owe yourself a test drive in one of the iterations of the Italian-American Dodge Dart. After making its debut for 2013 and serving up big changes for 2014, the Dart features only minor updates for the 2015 model year, mainly a few color changes and a new wheel design. Within its five trim levels, the Dart offers three engines. The base-level Dart SE uses a 160-horsepower 2.0-liter 4-cylinder, available with a 6-speed manual or automatic transmissions. Manual versions return 25 miles per gallon in the city and 36 mpg on the highway, while figures drop to 24 mpg city/34 mpg hwy with the automatic. The economy-minded Dart Aero uses a 1.4-liter turbocharged 4-cylinder that also makes 160 hp. With that engine, gas mileage reaches 27 mpg city/39 mpg hwy with the 6-speed manual or 27 mpg city/37 mpg hwy with the optional 6-speed automatic. 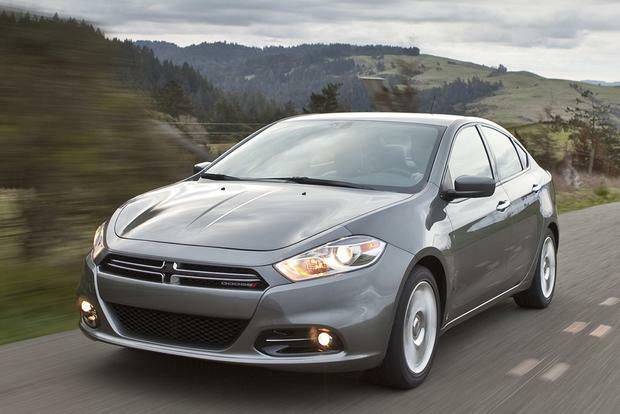 All other Dart models use a 2.4-liter 4-cylinder, which makes 184 hp -- a muscular figure for a compact sedan. With that engine, the standard 6-speed manual returns 23 mpg city/33 mpg hwy, while the optional 6-speed automatic is rated at 21 mpg city/30 mpg hwy. 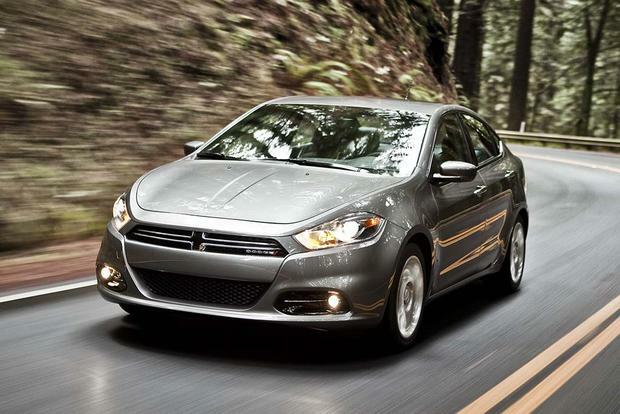 The Dart is offered in five trim levels: base-level SE, midlevel SXT, fuel-efficient Aero, sporty GT and upscale Limited. Shoppers who choose the base-level Dart SE ($17,200) shouldn't expect much. The sedan features only the basics, such as 16-in steel wheels with hubcaps, a CD player and power windows. Air conditioning is optional as part of the $995 Value Group, which also includes keyless entry and power locks. Step up to the Dart SXT ($19,200), and you're rewarded with several new items. Most importantly, the midlevel SXT offers the new 2.4-liter engine, while the fuel-efficient 1.4-liter is optional. The SXT also adds standard air conditioning, keyless entry, power locks and 17-in wheels. There's also a split folding rear seat with a trunk pass-through. Pick the Dart Aero ($20,900), and you'll find a similar list of equipment to the SXT, but you'll also get the 1.4-liter engine standard. 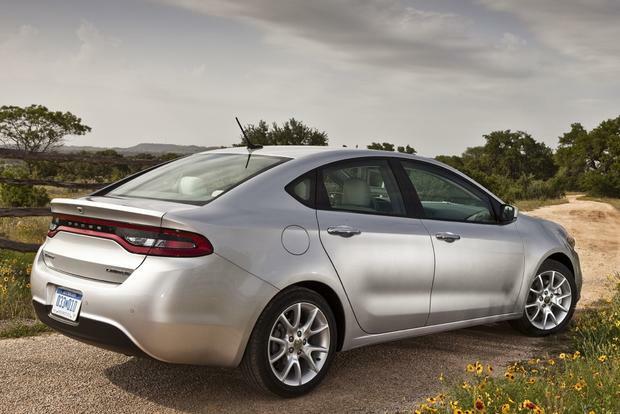 The Dart Aero's goal is gas mileage, and the model uses features such as active grille shutters to return around 40 mpg. Above the Aero is the sporty Dart GT ($21,600), which boasts a sunroof, dual-zone air conditioning, heated front seats and a park-assist system. The GT also offers sport steering and a sport suspension -- both tuned to improve handling -- along with a dual exhaust and dark headlight surrounds. Topping the Dart range is the Limited ($24,000), which adds several features including leather upholstery, an automatic transmission, a push-button starter and Chrysler's Uconnect navigation system. The Dart offers many options, including a sunroof and a Uconnect navigation system with a large 8.4-in center-mounted touchscreen. SXT and Limited models offer the 1.4-liter engine for efficiency-minded drivers, while rain-sensing wipers and proximity keyless entry are also available. The 2015 Dodge Dart comes with standard stability control, 4-wheel anti-lock disc brakes and ten airbags (front, front-side, front-knee, rear-side and full-length side-curtain). In government crash-test ratings from the National Highway Traffic Safety Administration, the Dart earned a 5-star overall rating, consisting of a 5-star frontal rating, a 5-star side-impact rating and a 4-star rollover rating. In testing conducted by the nonprofit Insurance Institute for Highway Safety, the Dart earned a stellar Top Safety Pick designation. Although the Dart's Giulietta-sourced suspension tuning was softened for American roads and tastes, there's still the soul of a driver's car in even the humblest Dart SE. The ride is never harsh, but it tends toward Euro-firm, and the Dart tackles corners with verve, reminding us of the nimble Mazda3. Dodge knows, however, that this car will spend most of its time commuting, so the Dart is still plenty comfortable when you're sitting in traffic or navigating well-worn urban streets. 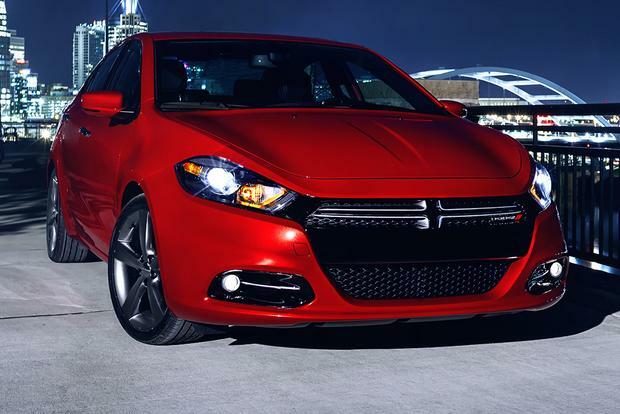 Like other SE models in the Dodge family, the Dart SE doesn't bring much to the table in terms of technology. There's a standard 3.5-millimeter audio input jack, but iPod/USB connectivity isn't available, nor is the 8.4-in touchscreen. Properly equipped, however, the Dart is a technological powerhouse -- and it all starts with that huge touchscreen, which is one of the most fun and intuitive that you'll find in any car. Compared to the complicated MyFord Touch system in the rival Ford Focus, the Dart's Uconnect touchscreen is an ergonomic knockout, providing almost iPad-like clarity and ease of use. Another Ford-like feature is the versatile 7-in thin-film-transistor display in the gauge cluster, which looks great and can be customized to show the information that you value most. We'd just like to see expected niceties such as iPod/USB and Bluetooth integration made standard across the lineup. Chevrolet Cruze -- Like the Dart, the Cruze offers a turbocharged 1.4-liter engine that's also available in a high-mpg Eco model. The Cruze's handling is comparably capable too, although the Dart has a sportier and higher-tech vibe inside. Ford Focus -- The Focus is one of the only cars at this price point that can keep up with the Dart's technology, and it boasts perhaps the best ride/handling compromise of any small car, the Dart included. See how you feel about the tight back seat, though. Mazda3 -- With the new SKYACTIV 2.0-liter inline-4, the 3 finally has competitive fuel economy, yet it hasn't lost Mazda's traditional sporty character. We also like the 3's handsome interior and its long list of available features. Although we appreciate the 1.4-liter turbo for both its high-revving ability and its exceptional fuel economy, we find it hard to turn down the muscular new 2.4-liter 4-cylinder. We strongly suggest that you test out both engines to decide which is right for you. The Limited is a great choice for shoppers interested in luxury, while the GT offers an option for sport-minded drivers -- leaving the SXT as the best compromise for shoppers who want a good compact sedan with a long list of available features.